One of the hardest things about eating GF (gluten-free) is finding a dessert recipe that tastes good and doesn’t have a weird consistency. Pinterest has been a great help in finding recipes, and I’m thankful for all the chefs experimenting in their kitchens and posting food blogs. Make the crumb topping first: in a small bowl, combine coconut flour, [brown rice] flour, coconut sugar, cinnamon, honey, walnuts, and coconut oil. Mix well- it should resemble wet sand. Set aside. In a large bowl, combine coconut oil, honey, coconut sugar, and pumpkin. Mix well. Add in the brown rice flour, GF general purpose flour, coconut flour, baking soda, cinnamon, nutmeg, cloves, and salt. [here add the ACV and flax seed] Mix until no dry pockets remain. Pour into prepared pan and top with crumb topping. I let the dessert cool in the pan to help it stick together and it did not fall apart when I cut it and served it. I’ve been told this also tastes good with vanilla ice cream or cool whip. 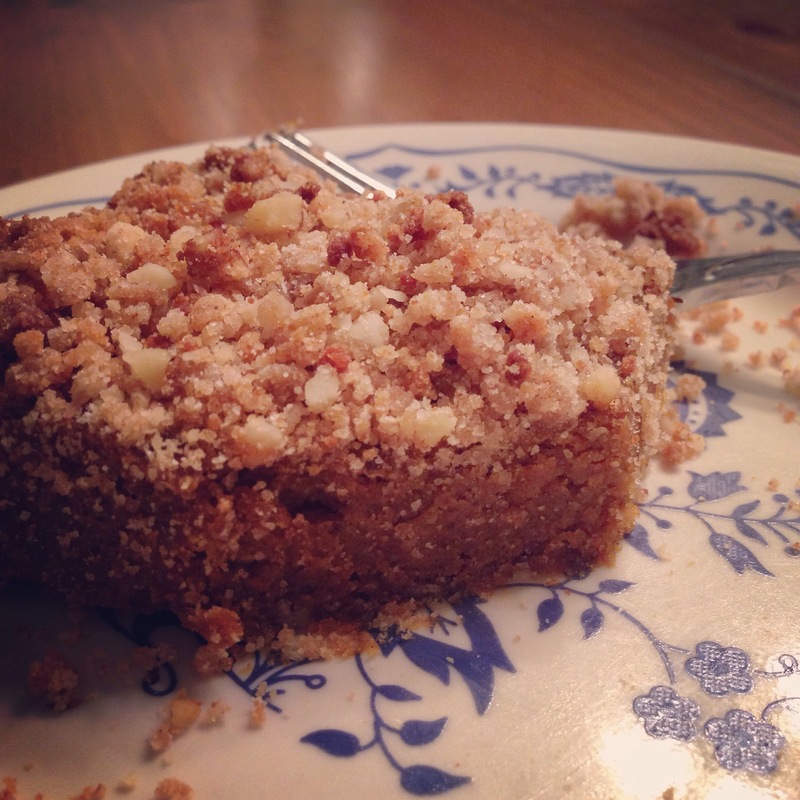 Posted on November 25, 2016 by Katie •	This entry was posted in Cooking Adventures, Home Living, Lactose-free Cooking and tagged Baking, dairy-free, dessert, egg free, gluten free, midnightbaker, nut free, pumpkin coffee cake, soy-free, Thanksgiving. Bookmark the permalink.